Yesterday The Spirit of the Black Dress Media Launch set off LMFF in fine style, with the revelation of ten elegant dresses created by new design talent with sustainability in mind. This brief blog is a taster for the big event tonight, The Spirit of the Black Dress Runway 2012 at The Trust. 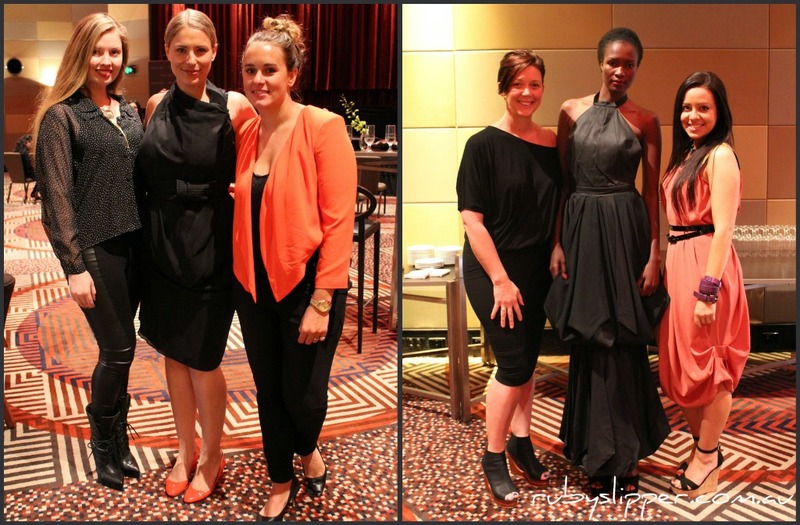 Carley of Jane Hayes Consulting checks in Calvin from Vanity Press – the venue of the launch was the luxurious Sofitel Melbourne. Left: A glamorous trio – Kyra Pybus of Pybus PR, Jane Hayes and Jemma Luxmoore. Right: Lisa Taranto designs.